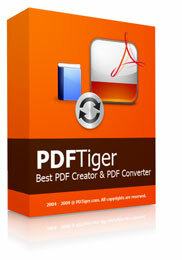 PDFTiger is a Word To PDF Converter, it also can convert other files PDF To Word Document files, like PDF to JPG, PDF to BMP, PDF to PNG, PDF to GIF, PDF to SWF, PDF to TXT, PDF to HTML, PowerPoint to PDF, Images to PDF. It is a commercial software, and costs $39.95 US dollars. Recently, we can get it for free in limited time, until October 21, 2010. So if you like you can grab it for free now.